Dunstan Farmers Engineering field bins are constructed to an extremely high standard of quality. Dunstan Farmers Engineering mobile bulk grain bins are tough, durable and designed to meet the needs of all farmers in the grain handling industry. Also known as mother bins or paddock bins, Dunstan Farmers Engineering Field Bins are ideal for storage and transportation of grain on properties and come in a range of sizes and capacities. Dunstan Farmers Engineering Field Bins come with many features and additional options to choose from. Dunstan Farmers Engineering bulk grain bins are engineered to help make your time more efficient and productive. 2 front steering axles, 2 rear axles, Overall length 8.839m, Overall width 3.495m. 2 front steering axles, 2 rear axles, Overall length 10.370, Overall width 3.495m. 3 front steering axles, 3 rear axles, Overall length 13.410m, Overall width 3.495m. 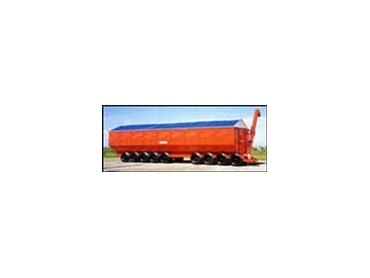 2 front steering axles, 3 rear axles, Overall length 11.895m, Overall width 3.495m. Either a 540 or 1000rpm PTO shaft, 14" vertical discharge auger, Hydraulic auger fold, Simple to adjust cover system on the floor auger, Easy to remove clean-out strip - full length of bottom of bin, PVC roll tarp roof that is hand operated with handles (that lock into place on both sides) supplied, Grain level inspection windows, Brand new 22" one piece rims and second-hand super single tyres. OMT 250 Danfoss hydraulic motor, 4-cylinder water-cooled Chinese diesel engine, Hydraulically operated roof, Flow control & divider wall, Toolbox, Extra windows, Elephant’s trunk, Drop tube, Auger lights, Auger, protector, Auger extensions, Fire extinguisher.